Yesterday brought some weird weather over much of Kansas. The kids and I were in town, Rachel is shorts and a t-shirt. It was so warm and humid during morning chores I was sweating! By the time we walked out of Hobby Lobby the temp. had dropped 30 degrees to 46 and we were none to happy to be out without jackets! 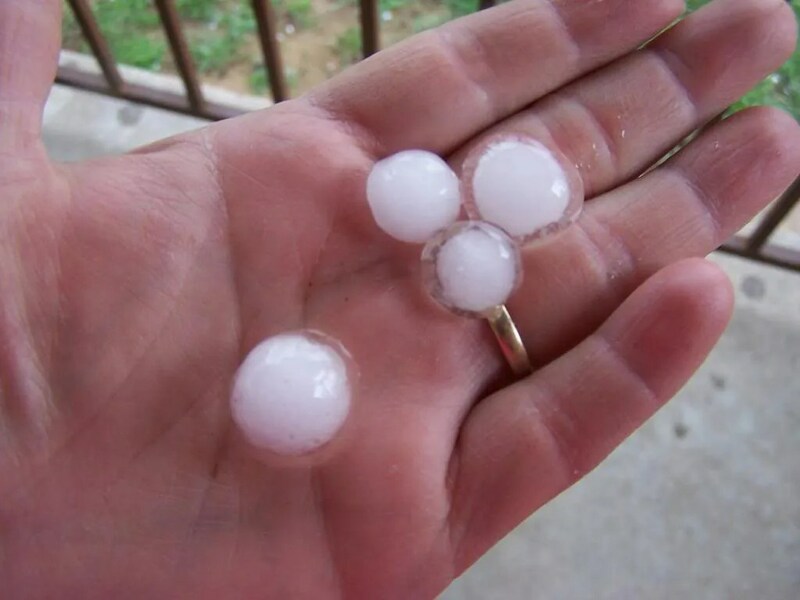 It sprinkled some and by 2 o’clock pelting ice-hail balls were smacking the roof of the house. By 3 PM it poured rain, much to my delight. The rain tapered off around 6:30 PM only to pick back up violently by 8 PM with a lovely thunderstorm, big old drops of rain and the sky lighting up and and over and loud cracks of thunder! I LOVE a good thunderstorm. I walked out to do evening chores yesterday between pelting ice hail and the goats were nowhere in sight. Odd, I thought, since the weather was awful, it was not like them to be away from the barn! The neighbor called just then to say they were in the next door neighbor’s woods happily munching away on the new rye grass sheltered by all the trees. Their house sits up on a hill and they can look down into parts of our proeprties. The wind must have popped the chain loose on the walk through gate we have between our neighbor’s property and ours, or the does learned how to unlatch the chain! “Oooooooooh girls!” , I yelled. They all came a’runnin’, babies in tow. They know a tasty meal when they hear it, and when they don’t too =). Last night the show outside was too good not to watch. We opened the blinds in our bedroom to a window that faces north and fell asleep listening to the the rain hitting the thirsty soil, the wind howling, the thunder clanging and the lightening lighting up the night sky. About 2 AM the power was surging and the carbon monoxide alarm kept going off to alert us that the power had it working again. Yeah, thanks for that! I suited up at 5:30 AM to check on everything/everyone in the barnyard. The gate was frozen shut and I had to virtually wade through a lake to get to it. The dogs – who rarely venture into the barn except on very hot days to catch the breeze blowing through or during very bad weather- had made themselves right at home in amongst the goats. The goats were very pleased to get a very early breakfast to replace the dredges left over from the night before. I was worried about our 2 month old chicks in the tractor as they have a tarp for cover and with that wind, I thought for sure it would go and I’d have chickencicles out there this morning but no, just a thick later of ice over the whole thing so much I couldn’t see them but heard them screaming for breakfast and water just the same! The doors were iced shut, fortunately the small door facing south had ice only on the inside so I was able to punch it open and get them a bowl of water and food, they were pleased and punch! 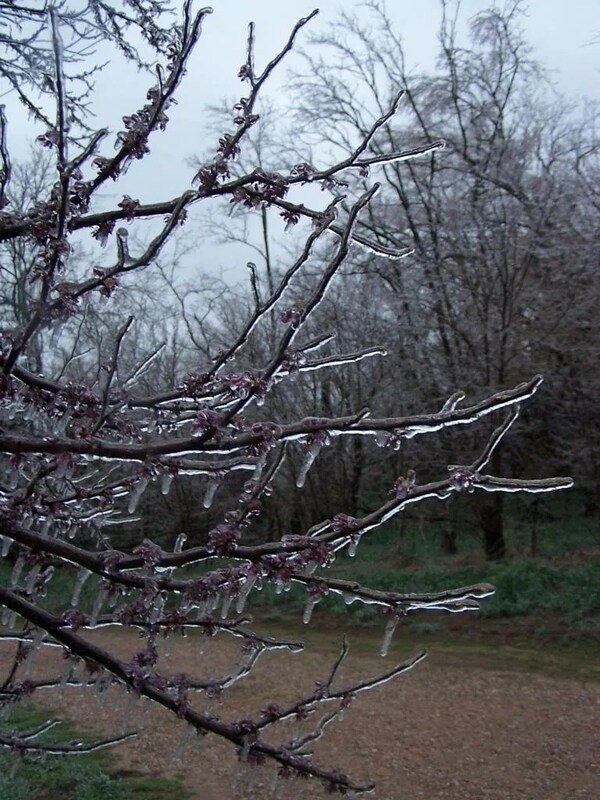 It’s really quite pretty out with a thick layer of ice incrusting everything, but also fairly dangerous as well! Two trees in our eastern pasture have broken. One at the trunk and another has broken a very large limb. 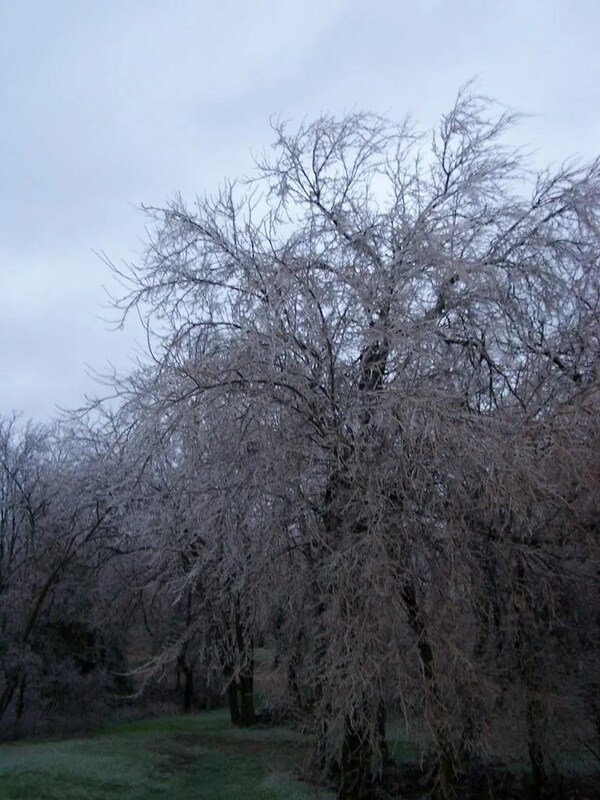 The willow trees that normally have branches that hang low are weeping on the ground and other trees are waning their limbs very low nearly to the ground from the weight of the ice. My Red Bud Tree out front that I so look forward to coming back to life again was just about to be gorgeous. Now, it’s frozen in time. I planted strawberries, 4 big ol’ pots of them, 2 days ago. They were the only plants I forgot to cover. Our neighbors generously shared about 40 starts with us. Jeremiah and I dug them up Sunday. We picked up some lovely 15 gallon pots at a farm auction a couple of Saturdays ago. I had planned to make them potato pots, but I took 4 of the 12 and planted strawberries instead. So we get a few less potatoes =). I should have put straw over the strawberries, I sure hope they are okay. Their saving grace was being flanked on the north by the greenhouse so I did not really see ice on them at all this morning. The pots are much too heavy to move into the greenhouse but I did go out last night and put the blueberry bushes in. We’ll see how the fruit trees do. A couple of them are leaning but should right easily once the ice melts, which may be tomorrow. Some of them already had buds on them, some did not. Our 2nd round of chicks started hatching on Sunday. The “dry incubation” method worked SO much better than the “no hatch” method that we followed on the incubators directions. It’s a shame to loose chicks! The tomatoes, peppers, eggplant, broccoli, and cabbage are all up in the greenhouse. Quite a few herbs are up as well. Even with a thick layer of ice, it was still warm in there this morning. Gotta love that! It’s still very cold out and overcast. We may get a little snow on top of the ice before it’s all said and done but, it’s April right? Things HAVE to get warmer from here, right?